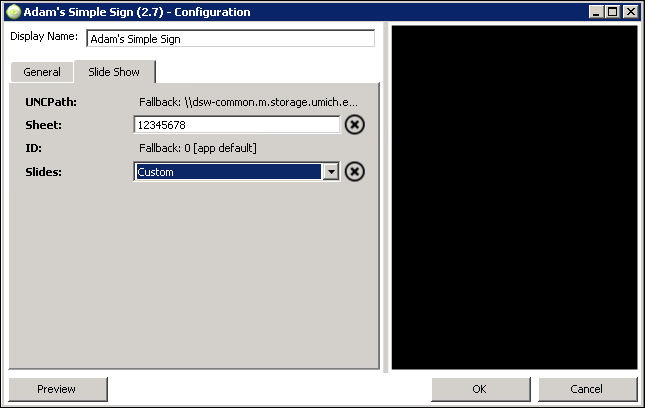 Note: The ITS Simple Sign App can be the exclusive sign layout (template) or it can be used in a rotation with other custom designed templates. Note: Refer to Log in to Content Manager for more information. Enter a Name for your sign that includes the building, floor, and general location of the sign. Drag-and-drop ITS Simple Sign onto your content player (sign) in the Network Overview. Note: To use the ITS Simple Sign "as is", Deploy the Sign. If the App is ever updated by the Digital Signage Team, you will receive a notification upon your next deployment. Right-click the ITS Simple Sign that you dragged-and-dropped onto your content player in the Network Overview. Note: Do not right-click the ITS Simple Sign listed on the Apps tab. Display Name: Enter a name for your sign layout. Background: You can replace the default background image with a .JPG or .PNG file. Any image should match the orientation of your sign or it will be stretched and distorted. The image must be stored at a UNC path such as the ITS provided file storage location: \\dsw-common.m.storage.umich.edu\dsw-common\Customers\UNITNAME. RSS Feed: Defaults to U-M News. If using a different RSS feed, include the entire URL. Keep in mind that the stories are not filtered. Orientation: Select landscape (default) or portrait. Logo: You can replace the default background image with a .JPG or .PNG file. 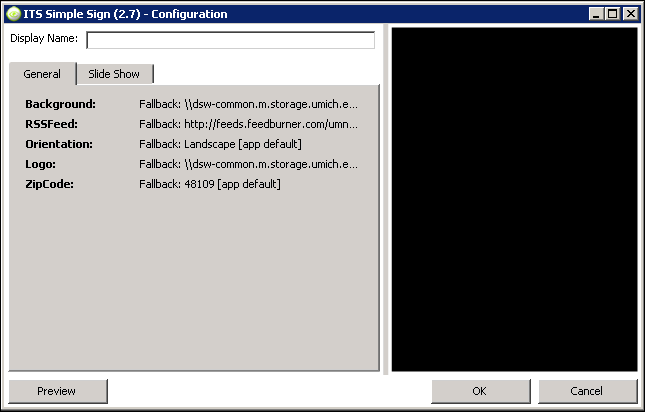 The image must be stored at a UNC path such as the ITS provided file storage location: \\dsw-common.m.storage.umich.edu\dsw-common\Customers\UNITNAME. Zip Code: The zip code drives the weather report for the digital sign. The default is 48109 (Ann Arbor). 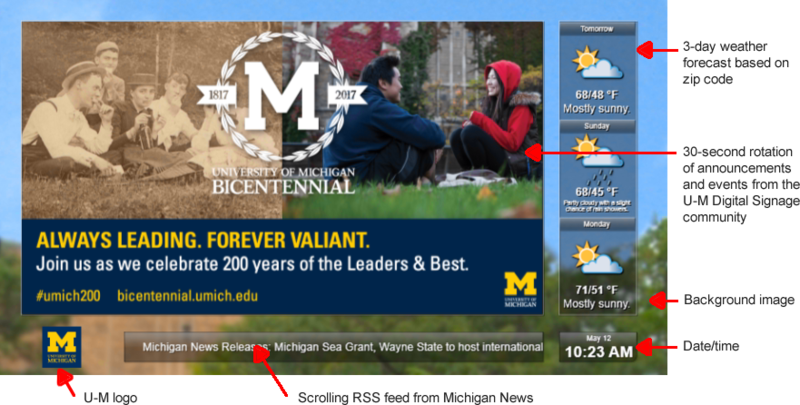 Note: If you wish to use the default (30-second rotation of announcements and events from the U-M Digital Signage community), go to step 8. Complete steps 4-8 only if you wish to use a Google Sheet Liva Data content item to control what displays in the Slide Show region. The Google sheet must be published. 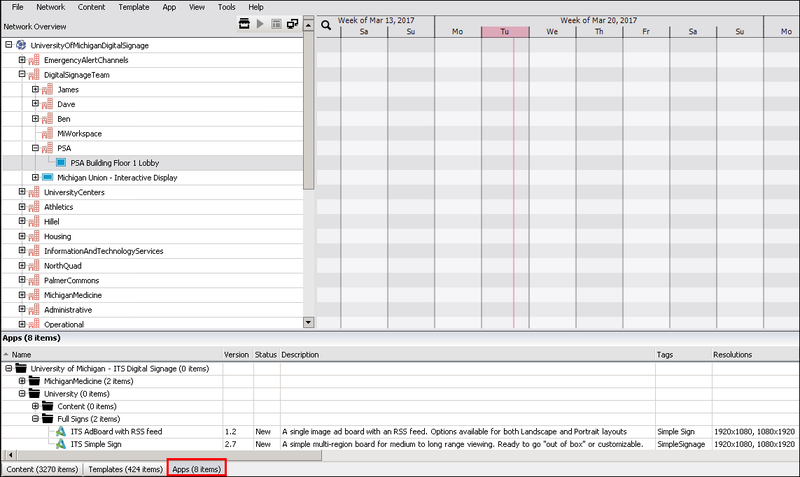 Looking at the google sheet, select File > Publish from the top menu. Note:The highlighted section between “/d/” and “/edit” is the key, copy that. Paste the Key in the line for “Sheet. The Default ID of 0 is usually correct. Note: If you have multiple sheets on your spreadsheet, each assigned to a different sign, you’ll need to overwrite the 0 value in the ID field with the GID for the applicable tab of your Google Sheet. The GID is the last number shown in the URL for the applicable tab of your Google Sheet. Select Custom in the Slides field. Click Preview and verify the desired layout/content displays. Note: If the App is ever updated by the Digital Signage Team, you will receive a notification upon your next deployment.